We are very excited to see the results of this paint job. 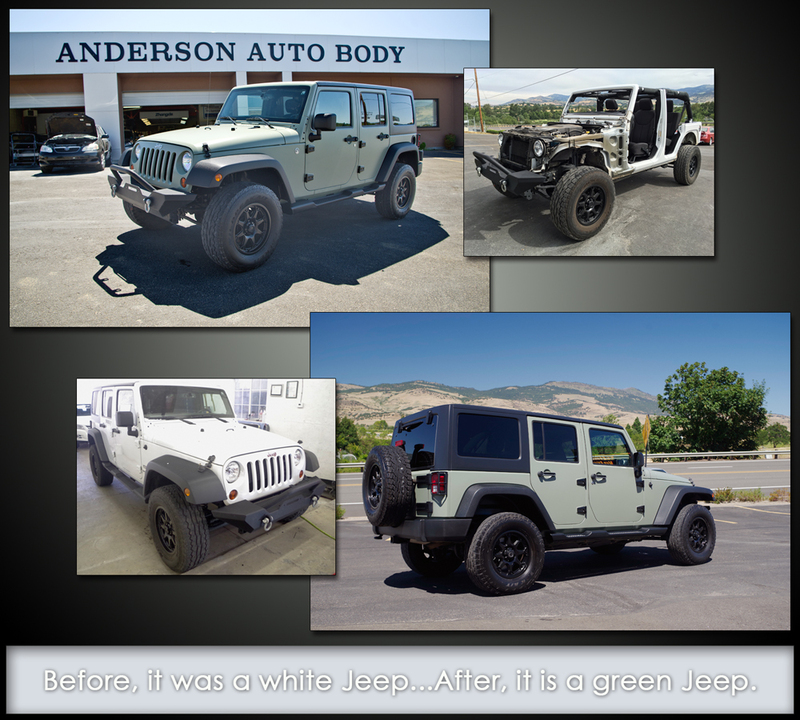 Heidi, the owner, had a wonderful idea for a flat military green paint job and we were able to execute her vision flawlessly. Thank you Heidi, not only for the work but also the pizza's from Great American Pizza Company, they were delicious. Your car may have dents. Those dents may have come from a hail storm or a run in with a shopping cart (the shopping cart won) and you’re faced with a decision: do I repair those dents or do I let them slide? There are several considerations you must make before deciding whether or not to repair car dents. First and foremost, what is your stance on vehicle appearance? Do you plan on re-selling your vehicle any time soon? Did the hail damage or door ding break through your paint sealant? If so, repairing the dents is the first step you should take for rust prevention. If a dent fractures your car’s paint sealant, that compromises the exterior of your car and makes it susceptible to rusting and corrosion over time. This process can occur rather quickly if your car is exposed to the elements, including precipitation, sunshine and salt left on the roads before after and during a winter weather event. If you live near an ocean, the salt water in the air can speed up the process of corrosion. Rust is like a bad rash for your vehicle. It may start with one little dent, and work its way through the body of your vehicle, compromising its appearance while significantly decreasing vehicle value. Rust can also spread to the inner working parts of your vehicle, eating away at valuable components. Appraisers and car buyers alike take dings and dents seriously. It’s why dealerships offer huge discounts when their lot is flooded with hail damaged vehicles following a large storm. It’s the difference between getting top dollar for your trade in and having to settle for, in some cases, thousands of dollars less. Dings and dents are a big deal for the automotive resale industry, and those in the market for used cars alike. A vehicle’s appearance inside and out is almost as important as its mechanical condition on the open market. Vehicle resale value can take a huge hit just because of a few dents. Making these improvements before trading in your vehicle can in many cases, fetch you more than just your money back. You want to keep your vehicle looking its best and you want to protect your investment from a financial standpoint. Paintless Dent Removal, done earlier rather than later, is one of the best ways to protect your investment and preserve vehicle resale value. It is important to remember that appearance is a large factor in determining trade-in value, so at some point, it may be beneficial to repair car dents before a dealership charges you double on your trade to do it themselves later. When you have your vehicle repaired at Anderson's, you're using Ashland's favorite. Come check out the inner workings and process of our work through our gratutitous Instagram account. Follow us for constant updates and great photos. Did you see Anderson's tow truck at the game?? 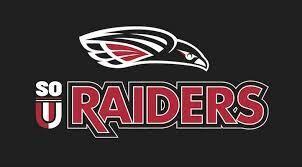 That's right, Anderson Auto Body's tow truck is going to be at the home Raider football games this year, too! Last year we were happy to let the SOU band use our tow truck for all their half time shows. We had many customers come in telling us that they had seen our truck during the half time show, and we really enjoyed the exposure it gave us! When we were approached this fall to see if we would like to be involved this year as well, we didn't hesitate to say yes. Get out there and support your RAIDERS!! They are having a really exciting season so far. And, let us know if you see our truck!!! A few months back, Angie Christianson of Rogue Valley Community Television interviewed Dave Anderson, the owner of Anderson Auto Body & Paint, asking him questions of his journey to the states. What was originally going to be one 1/2 hour segment, turned into 2 segments, as Angie realized there was a great story to hear of one mans dedications, dreams, and accomplishments. Please take a moment to watch these two videos. If you have had the pleasure of meeting Dave, or even if you've never met him, I am sure you will enjoy the messages therein. WE HAVE CARDBOARD...COME & GET IT! We are a busy shop. We work on a lot of cars, and need to order a ton of parts...hence we have a pretty consistent supply of cardboard boxes. Hannah Sohl picked up on that, and has been stopping by our shop over the last couple of weeks, filling up her Subaru with carboard from our recycle bin. The cardboard is being collected for a community project designed by Camila Throndike and Hannah Sohl called Rogue Community Climate Art Action. The cardboard gathered is being cut into small tiles cut in the shape of simple houses to bring home the message that climate change will impact our local community. The tiles are being decorated by members of the community, and represent what is loved about the Rogue Valley, and what they worry will be affected by climate change. The tiles (estimated at 1,000 plus) will be assembled into a large salmon and displayed in the Porters Restaurant and Bar parking lot and 147 N. Front St. in Medford on Feb. 17 at 2:30 pm. Sohl and Thorndike believe that art and social media are powerful tools to address important issues such as climate change, and we definitely agree. To find out more about this community event, and to learn how you can get involved check out their facebook page, Rogue Climate Art, or watch their interview on Channel 5, viewable now on YouTube. We are glad that we could contribute in some way for this "out of the box" community event used to raise awareness on climate change and how it will affect our local community. Hope to see you all there in the Porters parking lot on Feb. 17! If anybody needs any cardboard, come and get it. We recycle all the paper and cardboard that comes through the shop, and would gladly give it up to anybody who needs it! Getting in an accident hurts...your wallet, your car and your body!! Everyone needs a massage, especially after it's been jolted around in a crash. Hence we are announcing "BODY WORK FOR BODY WORK"!!! 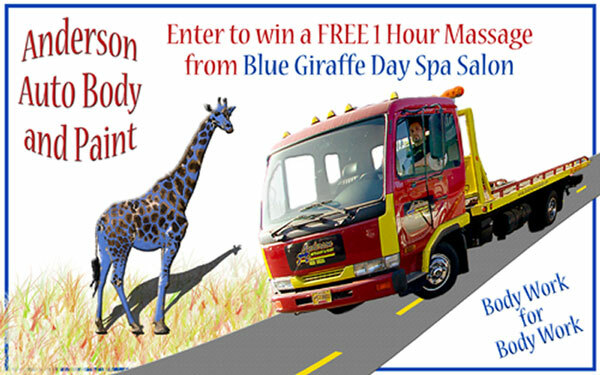 The Blue Giraffe Day Spa Salon & Anderson Auto Body have teamed up, providing a free one hour massage to a LUCKY customer of Anderson's EVERY month. 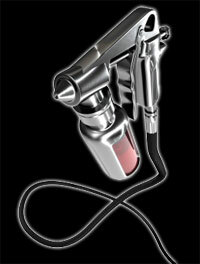 At the end of each month during 2013 we will draw the name of one of our customers... and that customer will be treated to 60 minutes of pure bliss. 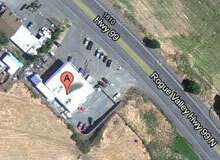 For more details give us a call 541.488.3635. Take care...of your car, and your body with Anderson's and the Blue Giraffe Day Spa Salon. If you have any ideas on other local businesses we can support by purchassing products for our goody bags...please let us know. 2012 SERVICE BUSINESS OF THE YEAR!! 10/18/2012: ASHLAND CHAMBER OF COMMERCE AWARDS ANDERSON AUTO BODY WITH THE SERVICE BUSINESS OF THE YEAR AWARD FOR 2012!! It was hard to keep it all a secret for two weeks from their father, but Galina and Aurel, managed to keep the award under wraps. As Livia Genise, artistic director of the Camelot Theatre, started describing characteristics of the recipient of the service business of the year award, you could see Dave's facial expressions unravel as he began to realize "Hey, that could be me she's talking about." As Livia continued expaining the work and background of the winner of this award you could see Dave as he began sitting up straighter, his cheeks becoming a little more red, and his face tightening and becoming a bit more serious. You could see that nerves were starting to fill his body, as he prepared for the possible visit to the stage. What was he going to say?? As Livia announced the winner, and called Dave Anderson, owner of Anderson Auto Body to the stage to receive the esteemed award, Dave looked over at his children with an overwhelmed and shocked expression. Being a fit man, who works out daily and eats very healthy, the vibrant owner of the shop walked swiftly to the stage, leaving in the dust his son and daughter, who were trying desperately to keep up with their father. Dave gets on stage, is handed the SERVICE BUSINESS OF THE YEAR award, a glass pumpkin blown by Gathering Glass Studio, and exclaims "I am so nervous, I hope I don't forget how to speak English!" The crowd of over 300 local business owners broke out in laughter, as Dave continued his "thank you" speech in English, with no problems. He explained to everyone how shocked he was that he had been recognized for this award, and that he really would have never, in a million years, expected that he would be on stage. He told the crowd of his amazement that he could be where is today, coming from a poor village in Romania with literally nothing to speak of, and making it all happen in this beautiful country he is so grateful to call home. As he closed, said a final thank you to the audience, he turned to his daughter and son, and exited the stage a proud, humbled business owner! October 18, 2012 marked a day that Dave will not soon forget, a culminating moment where goals were not only achieved, but were recognized by a community! It must be said: Thank you to all of our staff for making us shine, for the hard work that you do, and for the consistent quality that is provided to all of our customers. Thank you to our customers for your continued patronage, for telling your friends and family about our shop, and for helping us to keep our doors open. It is because of you that we are in business, and we are thankful that we have the opportunity to serve such an amazing community. Here is the link to the Ashland Chamber of Commerce site to view all award recipients at the 2012 Chamber of Commerce Awards Dinner.